BackUp structure is fully compatible with @stooged's DB_SG_Backup-50X structure. leonbassel, CYRES, ohcHIT and 10 others like this. Moved to its own discussion thread and mainpaged now, thanks for sharing @Sc0rpion! how to run this from wi-fi-usb ?? so does this mean we can dump any ps4 game to usb hard drive through ftp then? 1. Download the Ubuntu distribution from the Microsoft Store for Win 10. 4. 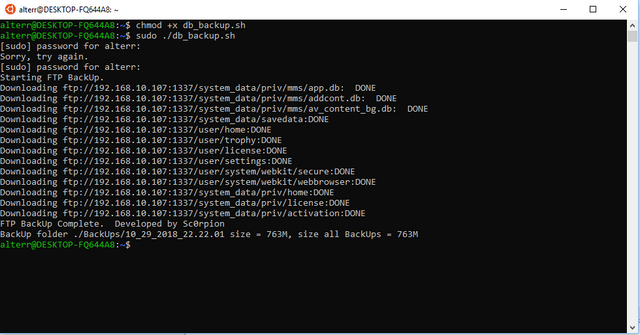 It is here that it is convenient to throw the db_backup.sh script. 5. In order for this script to work correctly, you must enter the PS4 IP address between the quotes in the ip_ps4 = "*********" field. 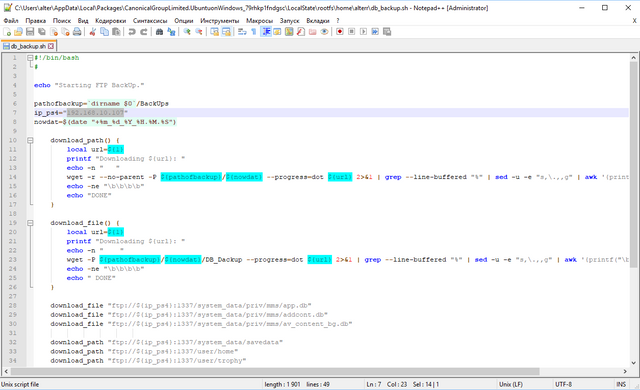 To do this, open the script with a text editor, for example, Notepad ++. 6. Run FTP Payload on PS4 and do not minimize this window. 9. Enter the previously invented password when prompted. 11. When the process is complete, close the Ubuntu window and you can move this folder anywhere. tota2017, Taufik and ohcHIT like this. Taufik, Alterr, Ozy666 and 1 other person like this. It's now Apr 21, 2019 at 10:42 PM.